"Greathouse" redirects here. For the surname, see Greathouse (surname). For other uses, see Great House (disambiguation). A great house is a large house or mansion with luxurious appointments and great retinues of indoor and outdoor staff. The term is used mainly historically, especially of properties at the turn of the 20th century,i.e., the late Victorian or Edwardian era in the United Kingdom and the Gilded Age in the United States. There is no precise definition of "great house", and the understanding of varies between countries. In England, while most villages would have a manor house since time immemorial, originally home of the lord of the manor and sometimes referred to as "the big house", not all would have anything as lavish as a traditional English country house, one of the traditional markers of an established "county" family that derived at least a part of its income from landed property. 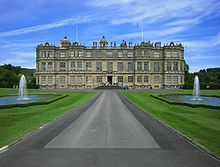 Stately homes, even rarer and more expensive, were associated with the nobility, not the gentry. Many mansions were demolished in the 20th century; families that had previously split their time between their country house and their town house found the maintenance of both too expensive. Many properties are now open to the public as historic house museums, either run by their ancestral owners on a commercial basis, or having been given to English Heritage or similar organisations. Others operate as hotels and wedding venues. Some still serve as the family seat. In Ireland, the term big house is usual for the houses of the Anglo-Irish ascendancy. In the United States, great houses can be found on streets known informally as "millionaires' mile" (or "row") in certain cities. In Jamaica, "great house" is the standard term for the house at the centre of plantation life, what in the United States is called a plantation house. One commonality between countries is that the family owning and occupying the great house were outnumbered, often greatly outnumbered, by their staff. There was often an elaborate hierarchy among domestic workers, probably most familiar to people today through television dramas such as Downton Abbey. As in the past, today's great houses are limited to heads of state, the very rich, or those who have inherited them; few in the developed world are staffed at the level of past centuries. Nowadays, the International Guild of Butlers estimates that the annual salaries of a 20-25 person household staff total in excess of US$1,000,000. On large estates or in families with more than one residence, there may be a steward (or the modern equivalent, an estate manager) who oversees direction of the entire establishment. Today, it is not uncommon for a couple to split the duties of management between them. The head of the household is not the butler, but the house manager. An estate manager manages more than one property, and usually has financial and managerial background. Butler The head of household staff in most homes; in charge of the pantry, wine cellar and dining room. In a small house the butler also valets for the master of the house. Male staff report to him. The butler is often engaged by the master of the house but usually reports to the lady of the house or sometimes to the housekeeper. Cook In charge of the kitchen and kitchen staff. Sometimes a chef is employed with several subordinate cooks. The cook usually reports directly to the lady of the house but sometimes to the housekeeper. If the cook is a woman, she is always addressed as "Mrs," regardless of her marital status. Housekeeper Responsible for the house and its appearance; in charge of all female servants, but can sometimes be the lead servant in a household. The housekeeper is always addressed as "Mrs," regardless of her marital status. Head Gardener Responsible for the grounds around the house; in charge of any additional gardeners or seasonal men and women brought in at times of harvest or planting. Stable Master Various titles used for the individual responsible for the keeping of animals, particularly those used for recreational pursuits such as horseback riding, fox hunting or dog fancy. ^ Pakenham, Valerie (2001). The Big House in Ireland. photographs by Thomas Pakenham. Cassell. ISBN 0-304-35422-8. ^ a b c d e f g h Evangeline Holland. "Domestic Servants in Edwardian England". Retrieved 2013-01-30. ^ a b c d e f g h Bricks & Brass. "Staff Roles". Retrieved 2013-01-30. ^ "Greathouses (Plantation houses)". Jamaica National Heritage Trust. Retrieved 18 October 2017. The Great House was the seat of authority on an estate. It was the home of planters, or attorneys who acted for the absentee owner. The size and profitability of the property and the wealth of the owner determined the size of the house. These houses were usually two storey buildings with a base of brick, cut stone and mortar. The top floor was usually made of wood. Variations of this archetype included one-storey buildings constructed of wood, cut stone or Spanish walling or wattle and daub; or two-storey building made of brick, wood or cut stone.